I have been loving the black and white color combo lately! It’s always in style! So you cannot go wrong with this $22 ruffle maxi dress (It runs TTS, but I think, there is limited selection left!). I’m going to have this one in my summer wardrobe for a very long time. I wore this pretty floral dress on a date night with the hubby. I was initially drawn to the dress because of its pretty pink color, but the style is really cute, too! Plus, I envision wearing it throughout fall with a denim jacket or cozy cardigan. This dress makes for a seamless transition from summer to fall. While browsing the store, I first laid eyes on (and knew I had to have) this beautiful pineapple midi skirt, but then I spotted the matching top! I usually don’t like to match too much, but this set totally works. (See me wearing the top with my fave mom shorts below.) These pieces are timeless, and I will be wearing them for many years to come. Pom poms and tassels are all the rage right now, and for good reason. They are just so stinkin’ cute! 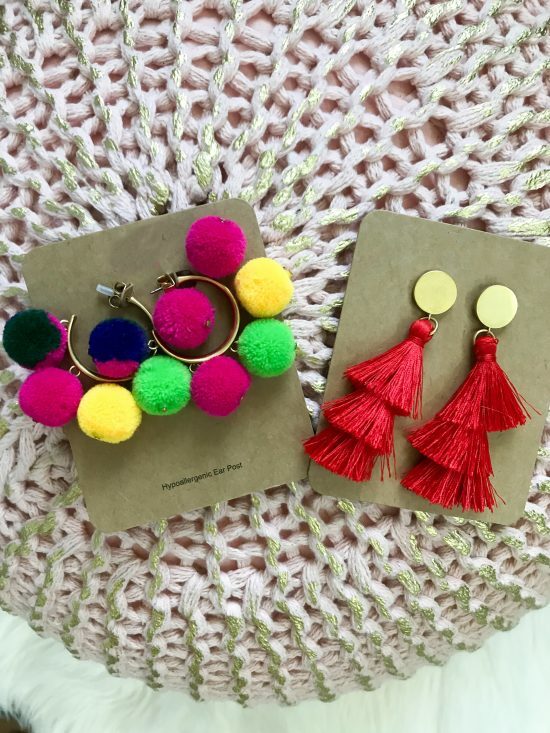 You can snag the pom pom hoops on sale for about $25, and the super versatile tassel earrings for under $24. Plus, the tassels come in a whopping 7 other hues! I love gingham, and I love peplum, so this gingham smock cami is a no-brainer. And at $18, so is the price. The only downside is that there are only a few sizes left to choose from. How fun are these colors an stripes! This top makes a huge fashion statement with zero effort. If you want to look like you’ve got your fashion sense together, this top will achieve that! A blogger friend of mine even ordered on after she saw mine, and she loves it, too! I wore this chic jumpsuit to Mother’s Day Brunch. 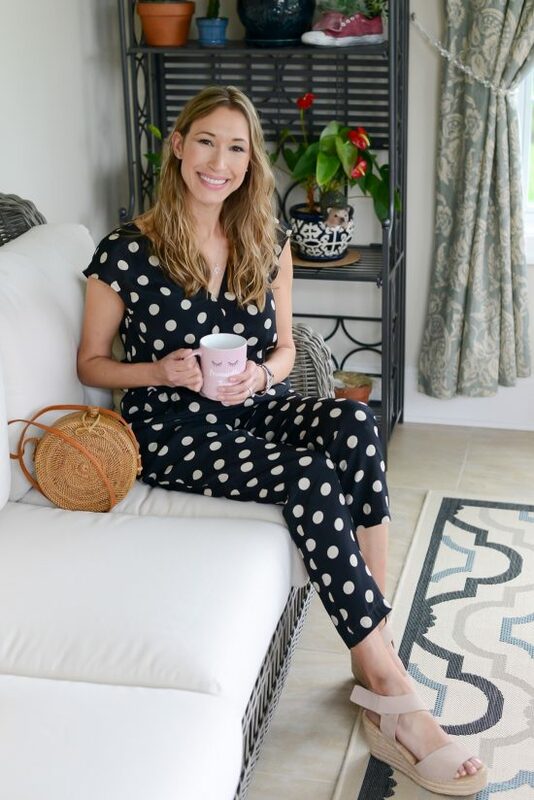 It’s such a chic little investment because black and white dots never go out of style, and the jumpsuit flatters any body type. Also, you can wear this number on just about any occasion with various accessories. I highly recommend this one! (Runs slightly large- size down.) Totally en vogue! Looking for more deals? The Nordstrom Anniversary Sale ends Aug 5. It’s the best sale for stocking up for fall! Click here to see what I bought! I always strive for affordability! And thanks so much. It means a lot! Oh I adore that top! Thank you! Love all those glorious dresses! How fun!! Thanks for sharing them! Oh my gosh I love it all but especially that pretty pink floral dress! That one had me at hello. It’s comfortable, it’s the perfect color, and I just love it! You always have the cutest finds! I think my favorite would have to be the black and white maxi dress! Thank you! I think that dress is just all-around cute and flattering! Thank you! I love the varying directions of the stripes! That off-the-shoulder top is FANTASTIC! I love the bold colors! Thank you! Isn’t it super fun to be bold sometimes? Everything looks so cute!! I especially like the maxi dresses and how flattering they are!! Thank you! Oh, aren’t they? I am a sucker for the ruffles at the bottoms! All these outfits look wow! !